Co. Down: Ballygowan, Ballyhalbert, Ballymaglaff, Ballywalter, Bangor (4), Comber (2), Carrowdore, Donaghadee (2), Grey Abbey, Kilmood (2), Kircubbin, Moneyreagh, Mount Stewart, Newtown Ards (2), Newtown Ards South (2), Tullynakill. The Board also included 8 ex-officio Guardians, making a total of 32. The Guardians met each week on Saturday at 11.30am. The population falling within the Union at the 1831 census had been 53,873 with divisions ranging in size from Ballymaglaff (population 1,696) to Bangor (9,355) and Newtownards itself (5,668). 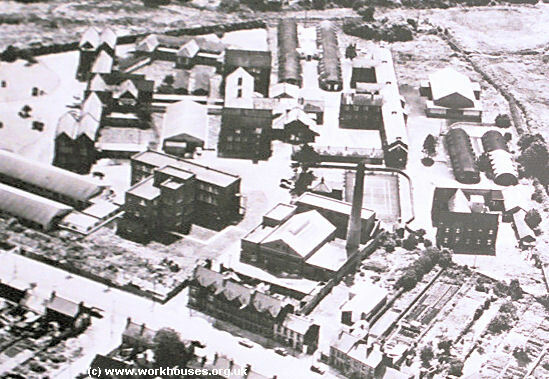 The new Newtownards Union workhouse was erected in 1840-1 on a 8.5-acre site at the west of Newtownards. Designed by the Poor Law Commissioners' architect George Wilkinson, the building was based on one of his standard plans to accommodate 600 inmates. Its construction cost £4,835 plus £1,035 for fittings etc. The workhouse was declared fit for the reception of paupers on 21st December 1841 and admitted its first inmates on 4th January 1842. The workhouse site location and layout are shown on the 1932 OS map below. An aerial view shows the layout of the site in the 1950s. Newtownards aerial view from the north, 1950s. The buildings followed Wilkinson's typical layout. An entrance and administrative block lay at the east. This was considerably extended during the famine period in the late 1840s. 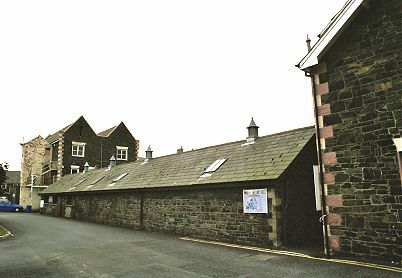 Newtownards entrance block from the south-east, 2003. Newtownards main block from the south-east, 2003. 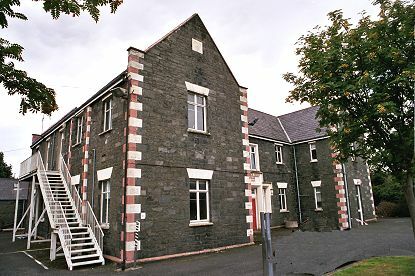 Newtownards infirmary block from the south-east, 2003. 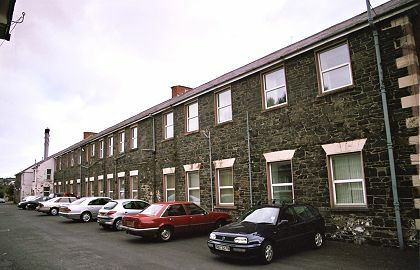 Newtownards rear of infirmary block from the south-west, 2003. A 60-bed H-plan fever hospital was erected at the north-west of the site, receiving its first admissions in May 1845. 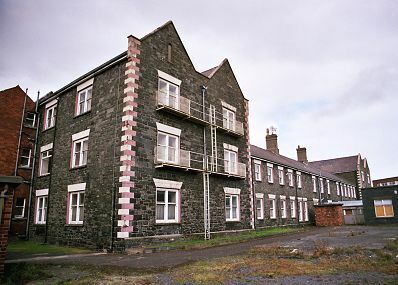 Newtownards fever hospital from the south-east, 2003. During the famine in the mid-1840s, sheds and sleeping galleries were erected to accommodate an additional 200 inmates. A long single-storey block running between the main block and infirmary may have been part of the fever accommodation. Newtownards fever sheds(?) from the north-west, 2003. At the 1901 census, the population of the Union was 41,920 with 291 inmates in the workhouse. In 1922, the site ceased operation as a workhouse and its existing inmates were transferred to Downpatrick. They had to walk the 29 miles as no transport was provided. In 1932, the site became Ards Hospital. 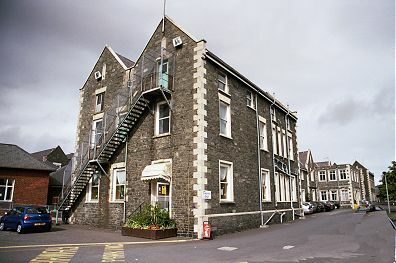 The fever hospital was converted for use as an old people's unit, and the infirmary was then used as a fever hospital, with the dining hall being demolished. Public Record Office of Northern Ireland, 2 Titanic Boulevard, Titanic Quarter, Belfast BT3 9HQ. Holdings include: Board of Guardians' minutes (Apr 1946 - Oct 1945); Indoor relief lists (1939-48); Births (1905-45); Deaths (1921-40); etc.